Too often a carpet cleaning tech skips a pre-vacuuming, reasoning that the carpet has already been vacuumed prior to deep-cleaning. The question is: Was it thoroughly vacuumed with a powerful unit? Impacted soil is removed by a detailed and intensive beater bar vacuum process. When the overall soil load is reduced, the cleaning agents and equipment experience an easier time impacting and extracting the soil. By reducing the soil load by even 10%-20%, the finished cleaning results will show an improvement. Beater bar vacuums pre-groom and stand fibers erect so the pre-spray has a better chance of accessing 360 degrees, thus surrounding the fibers. Turbulation created by a beater bar and rotating brushes, vibrates the carpet backing and digs into the pile to shake loose embedded soil. Skipping the pre-vac process may leave the carpet with a heavier soil load to be removed. The extra extraction passes turn some of the soil to mud. With even a 90% removal rate, that still leaves 10% of the soiled effluent settling to the base. Now even more passes are required until the rinse water is clear. When the carpet is oversaturated, it becomes an excellent candidate for delayed wicking of the remaining particulate. Another obvious consequence of skipping a pre-vac is that debris plugs up extraction equipment. Solid soil stops up filters, lines and extraction heads, encumbering the removal process. 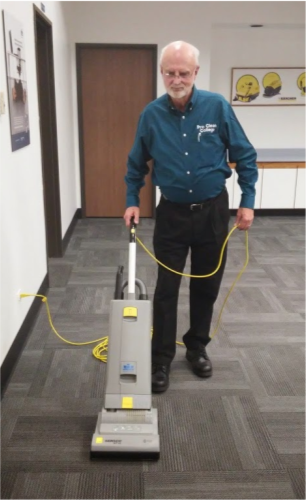 Remember: An improved process creates greater efficiency and a cleaner carpet.